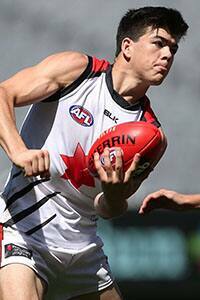 MOBILE forward Harry Himmelberg has enhanced his draft stocks with a best-afield display for the Allies in their win over the NAB AFL Academy on Grand Final morning. The 191cm forward kicked a goal and had 19 disposals in the Allies' 13.10 (88) to 12.2 (74) victory at the MCG in the curtain-raiser to the Hawthorn and West Coast premiership decider. Himmelberg, who was overlooked at last year's draft after an injury-impacted season, is eligible to join Greater Western Sydney as an academy-aligned prospect. But he showed all clubs his talent and smarts in the forward half on Saturday during the NAB All Stars match, twisting and turning past opponents and showing a creative streak near goal. Fellow Giants academy prospect Matt Kennedy also impressed, gathering 19 disposals, seven clearances and five inside-50s. Kennedy, who missed three months of the season with a knee injury, showed why he is expected to be a top-10 pick with class overhead, strength at the stoppages and smarts at ground level. Corey Wagner (17 disposals) and Daniel Rioli (19 disposals, one goal) were other strong contributors for the Allies in their 14-point win, while Tasmanian Mitch Hibberd's poise in the air caught the eye. The Allies, who are eligible for this year's draft, were too strong for the Academy, who cannot be drafted until 2016. But the Academy squad, who were coached by Brenton Sanderson, rallied with a five-goal final quarter to get within seven points before Allies key forward Wylie Buzza kicked his third goal to seal the win for his team. Forward Ben Ainsworth was among the Academy's best, finishing a super season for the young Victorian. He found 13 disposals and kicked two goals and again proved he is already set to take his game to the elite level. Ainsworth will be an early draft pick next year, likely alongside West Australian speedster Sam Petrevski-Seton, who booted two goals from 12 disposals. Half-back Alex Witherden (14 dispoals, five rebound-50s), Noah Hura (15 touches) and Jack Bowes (16 disposals) were also strong performers for the Academy, who rotated through 29 players.